Galway Bank was rather short lived. 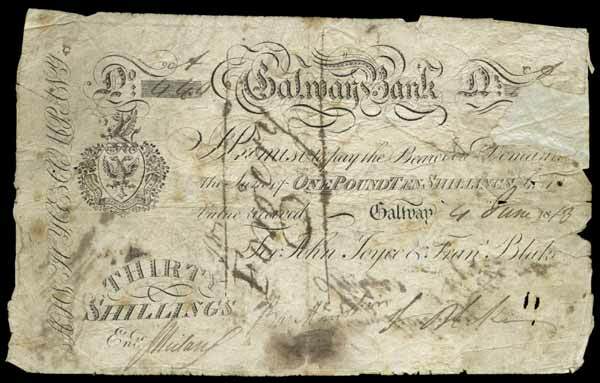 Galway Bank One Guinea 1813. As ever, more to follow. 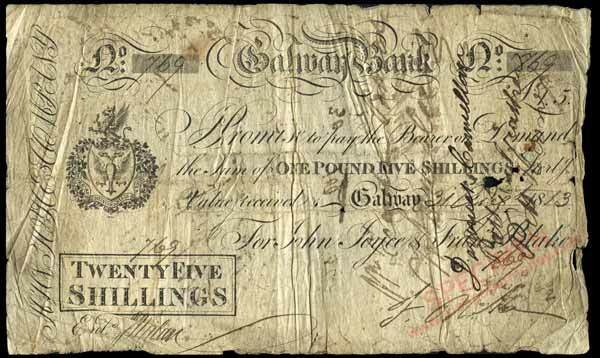 Galway Bank 25 Shillings 1813. An unissued 30 Shillings note from this partnership. A second type of 30 Shilling note from this partnership. Although marked as a forgery, this example is probably faithful to the original design. Are there any pictures of £3 or £5 notes for this bank? I have not seen a £3 or £5 note from this bank, although 3 Guinea Post Bills are known. Example attached. 3 guineas is kind of a wierd denomination for a banknote. Dont think I've seen one before. Denominations tended to exist for certain transaction types, I expect. 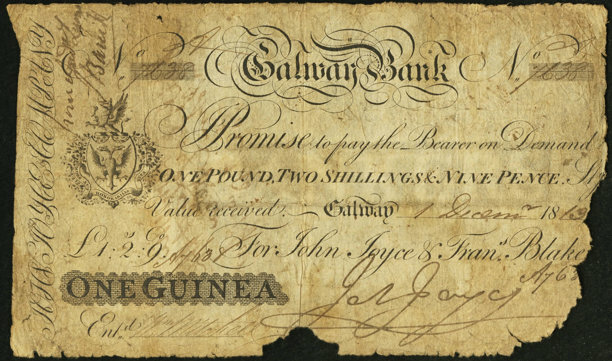 Here is a Galway Bank note from a different partnership, Walter Joyce and Mark Lynch. Another unusual denomination. Last edited by DOC on 12 Aug 2018 20:49, edited 1 time in total. 6 shillings is odd, I dont remember seeing this for another bank. I guess the denominations printed by the banks were what was needed at the time by commerce. 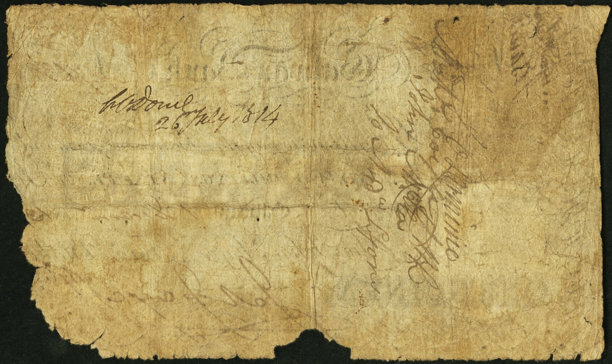 Lower value notes were intended to compensate for the chronic shortage of coinage which resulted from the Napoleonic Wars. According to PMI, 'silver notes' were defined in an Act of 1799 as notes for 9 shillings, 6 shillings and 3 shillings 9 and half pence. The last one equates to 1/6th of a British Guinea. The non-equivalence of the Irish and British pounds lead to odd denominations in Irish currency. DOC wrote: The non-equivalence of the Irish and British pounds lead to odd denominations in Irish currency. This adds a bit of extra interest to the bank notes of the time too. It seems likely that the bank of John Joyce & Co. failed in 1814 in the fall out surrounding the collapse of Ffrench’s Bank. 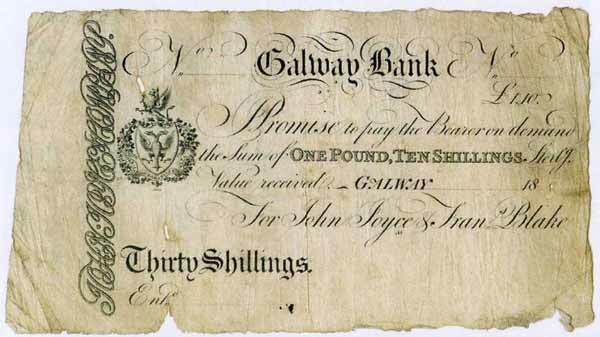 Of Mr. Joyce's (Galway) debts, I believe almost ten shillings in the pound have been paid, and it was the general opinion, that from his highly honourable character, activity, and skill in business, had he lived, the remainder would in a few years have been paid.